More Than 30 Associates Toured FBSJ and Helped Prepare Food for its Summer Meals Program. 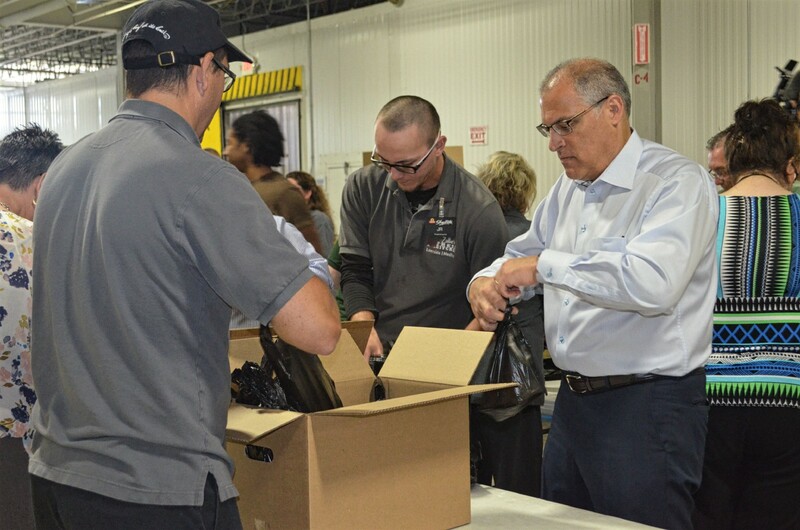 Pictured far right, David Zallie, owner of ShopRite of Medford and ShopRite of Lawnside, volunteers at the Food Bank of South Jersey alongside ShopRite associates in preparation for ShopRite’s Partners in Caring donation drive to help raise money for local agencies that fight hunger in South Jersey. More than 30 associates from ShopRite of Lawnside and ShopRite of Medford visited the Food Bank of South Jersey (FBSJ) on Thursday, Aug. 3 to help prepare snacks for the FBSJ Summer Meals Program, which aims to feed 8,000 children at 168 sites across Camden, Burlington, Gloucester and Salem counties this summer. Volunteers are critical to ensuring that FBSJ packs and delivers 5,000 meals daily. The visit also included a site tour and meetings between ShopRite associates and FBSJ leaders to discuss FBSJ programs and needs as ShopRite annually supports FBSJ programming and initiatives. This visit to FBSJ was in preparation for ShopRite’s focused donation drive in September for its Partners in Caring Program, a year-round, community-based, hunger-fighting initiative that provides nearly $3 million annually to qualified charitable agencies in New York, New Jersey, Connecticut, Delaware, Pennsylvania and Maryland. The Food Bank of South Jersey is an annual beneficiary of ShopRite’s Partners in Caring Program. ShopRite of Medford was the top store over the last two years in terms of fundraising for Partners in Caring, and the store looks to remain on top to continue supporting the Food Bank of South Jersey and other Southern New Jersey agencies. Among its upcoming Partners in Caring fundraising activities, ShopRite of Medford will host a Labor Day 5K and 1-mile Fun Run/Walk in Medford on September 4. Interested participants can sign up here by September 2. Both ShopRite of Medford and ShopRite of Lawnside are also currently selling raffle tickets for a $500 shopping spree, and both will host silent auctions in mid-September.